Want to know how where and how to store your vehicle? Read on! Where Can I Store My Vehicle? Indoor Storage. An indoor climate-controlled facility is ideal for long-term vehicle storage. Your car, RV or boat will be protected from the elements decreasing the chances of any damage to your vehicle. When you rent with STORExpress you can touch up, polish, check up on and run your vehicle whenever you like! There’s even a car club where you can mingle with other car enthusiasts and check up on your vehicle right from your mobile phone. Outdoor Storage. If you can’t store your car indoors, you can still make the most of outdoor storage. STORExpress gated facilities that are monitored around the clock. How Do I Keep My Vehicle From Damage While in Storage? After you choose where you’re going to store your vehicle, you need to take the proper precautions to protect your vehicle from the elements. Clean Your Vehicle. Prep your vehicle for long-term storage by giving it a good wash, wax, and shine. Wash all of the bugs, dirt, and debris off so that you can start fresh when you’re ready to take your vehicle out of storage. Cleaning your vehicle helps to keep the paint job looking nice and stops dirt from getting into the delicate electrical system. Dirt on your vehicle can also trap moisture which can lead to engine issues, rust, and other problems. Also, clean your vehicle on the inside so bugs aren’t attracted to your car. Throw away any open food containers and vacuum in the interior and the trunk to make sure any crumbs that could bring in pests are gone. Prepare the Fuel System. Having a full tank will help prevent moisture from building up on the walls of the tank. After your tank is full, add a fuel stabilizer product. 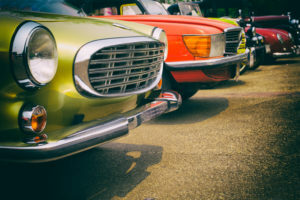 According to Popular Mechanics, “drive the car long enough to really warm up the engine and mix the stabilizer with the fuel—at least 30-40 miles.” If the directions are followed correctly the stabilizer should extend the lifetime of the gasoline to 12 months. Change the Oil. After adding stabilizer, you’re ready to change the oil. It’s important to do this to prevent gunk in your engine. Run your vehicle for a few minutes to let the fresh oil circulate through the engine. Take Care of the Battery. When you’re ready to store your vehicle, disconnect your battery and bring it inside. Connect it to a float charger during the time that your vehicle is in storage. Inspect your battery for any deterioration. If you’re storing indoors at STORExpress, you can leave the battery in your vehicle and attach a trickle charger to one of STORExpress’ trickle charger outlets. Your battery will stay charged because it has a continuous amount of energy running through your vehicle. Pack Your Exhausts. If you’re storing outside in an open lot, place clean rags or aluminum foil into your tailpipe to protect the engine from any bugs entering into your engine. Cover Your Car. Regardless of where you store your vehicle, covering it will add an extra layer of protection. Looking for long-term car storage? Stop by any one of our 10 STORExpress locations for outdoor vehicle storage. If you’re looking for indoor climate controlled vehicle storage check out our Etna, McKees Rock, and Turtle Creek locations. Call 412-449-0123 for more information and to set up a tour!